Combine all ingredients in a blender or food processor and pulse until desired consistency (I like it smooth). Refrigerate for at least an hour to let flavors blend. This makes about 5 cups of salsa, so buy lots of chips! I'd say this is in the range of mild to almost medium heat. It will also give you bad breath so this is not a recipe for date night. It should be mentioned that my tomato-hating 6-year-old can't get enough of this stuff. i just discovered a similar recipe using only canned tomatoes. it's awesome! 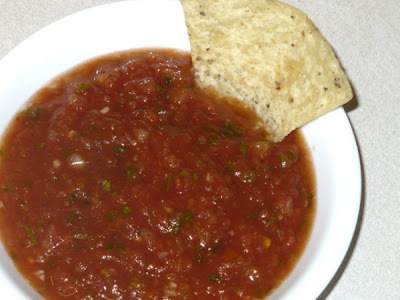 the great part about using canned is that because the tomatoes are cooked, the salsa will keep a long time in the fridge, just like cooked jarred salsa! oh, i forgot to say it uses fire roasted canned tomatoes, which are delicious!